NEM (XEM) is a decentralized, peer-to-peer cryptocurrency and blockchain platform that launched in March 2015. Since then, it has grown to become a Top 10 cryptocurrency with a market cap of more than $1.8 billion (at the time of this writing). There are 9 billion XEM coins in circulation, all of which were created before the launch. NEM is written in Java, and it was built from the ground up, in order to address issues that are faced by many cryptocurrencies today (such as ease of use, speed, and scalability). NEM introduced a new feature to blockchain technology called Proof of Importance (POI). It is somewhat similar to Proof of Stake, but it includes more variables. With NEM’s POI, the more coins a user has—and the more transactions they make—the more importance they’re given. This impact encourages actively using XEM coins, rather than simply holding them. Instead of mining, NEM has a feature called harvesting. It doesn’t require any special hardware, but to start harvesting, you do need to have at least 10,000 vested XEM coins. Anyone running Supernodes (see below) and processing transactions get paid by processing the payments for the network. The advantage of harvesting is that it uses a lot less electricity than mining, which means lower transaction fees. As such, NEM is a much more energy-efficient cryptocurrency than Bitcoin (BTC). The Supernode program rewards people who are running active nodes. High-performance nodes help secure the network. Those meeting bandwidth, chain height, ping, and responsiveness requirements are randomly given awards. However, in order to participate in the Supernode program, you must have at least 30 million XEM. 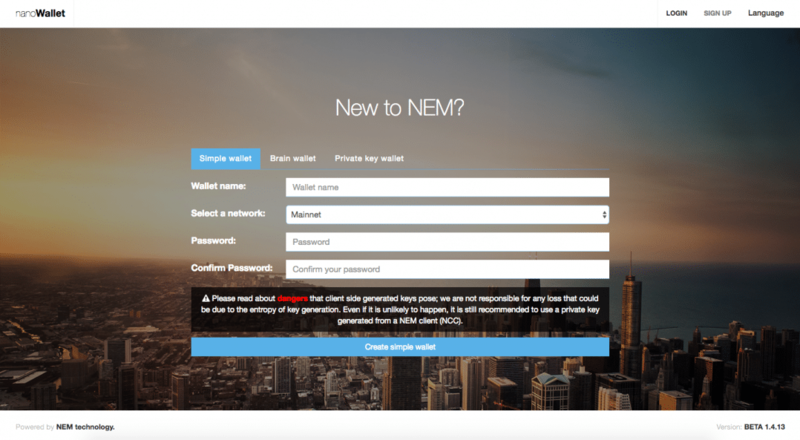 If you’ve decided that NEM is the right investment for you, you’ll almost certainly want an NEM wallet to keep your XEM coins safe. The alternative is keeping your coins on exchanges. Unless you’re planning on day-trading, I strongly advise against storing your coins on exchanges for security reasons. Unfortunately, when it comes to NEM wallets, you don’t have a great deal of options. The only real option is the NEM Nano wallet, a desktop wallet that’s compatible with Windows, Mac, and Linux. There’s also an NEM Mobile Wallet that can be downloaded via the Android App or iPhone App. But the desktop wallet is generally considered the best option. Therefore, the NEM mobile wallet has received mixed reviews that cite crashes and bugs. Go to the NEM Downloads page, and select the relevant version of the wallet: Windows, Mac, or Linux. You’ll find you have a choice of wallet types: Simple Wallet, Brain Wallet, and Private Key Wallet. I recommend choosing Simple Wallet. Enter a name for your wallet. In the ‘Select a Network’ section, keep the default option of ‘Mainnet.’ Then enter a secure password. Click ‘Create Simple Wallet.’ Your wallet will then be saved as a .wlt file, which contains your private key. You’re now at the login page. Select the newly installed wallet, and type in your password. Click ‘Sign In.’ You’ll now be taken to the interface, and you’re ready to go! On an exchange, purchase NEM with fiat. This purchase can only be made via a couple of small exchanges, such as Exrates (XEM/USD) and LiteBit.eu (XEM/EUR). Purchase BTC, and exchange it for XEM on the same platform. You can make this purchase on larger exchanges, such as Bittrex, Poloniex, or HitBTC. In the case of Bittrex, you can also exchange Ethereum (ETH) for XEM. It’s probably the best option available at the moment. Purchase BTC, then transfer it to another exchange before trading it for XEM. The final option is buying BTC on an exchange that does not have NEM (such as Coinbase, Kraken, or Gemini). Then transfer it to another exchange, in order to swap it for NEM. Another option is to purchase BTC at an exchange of your choice, then swap it for XEM on an exchange called Changelly. This exchange is unique, in the sense that almost no verification is required. Just sign up with your email, and you can swap Bitcoin or any other crypto for NEM within 30 minutes. Be sure to check out this Changelly review, and directly compare Changelly with another cryptocurrency exchange called Shapeshift. NEM is a very transparent and traceable cryptocurrency. But much like Bitcoin, it has little in the way of privacy features. While not revolutionary, NEM is a very functional coin. The fact that it’s a Top 10 cryptocurrency is evidence of its functionality. Although there aren’t many NEM Wallets available, the NEM Nano Wallet works well. Purchasing NEM is straightforward enough that it has a number of exchanges that offer a NEM/BTC pair. Have you had an experience with NEM? I would love to hear about it, so just leave a comment below. I follow the the instructions & download “NanoWallet” to my Mac but it said “NanoWallet” can’t be opened because it is from an unidentified developer. What steps should I do to make it works? I love your very much because you give something different every time in your blog. I want to introduce you about new crypto coin that is Abot Coin, it is different and secure than others and very secure. Hi, but I cannot find XEM/NEM on Changelly website, how does this happen?? This is a little off subject, this is in regards to new Tokens received. I recently received Tokens from a ICO. These Tokens are in Myetherwallet. How do I get these in a safer place? Or do I need to move them at all?? thanks for this very useful info. However once I downloaded my wallet, it’s asks me to buy a software program called WinRAR License. Is that correct. Thanks for the great information. I wonder how this coin has made the top 10. I hate the fact that you have to download the wallet. I’m definitely keeping an eye out for this one to see where it goes. The price is right but the more complicated the process is to purchase and store the coin, the fewer people will be inclined to invest in it. They need to simplify the process and increase the availability to purchase it. Again, thanks for a great article! I’ve saved this page and will definitely be back.